agricultural ecosystems | WHY DO WE LOVE CHOCOLATE? Het Duitse bedrijf Lotao introduceert biologisch gecertificeerde 100 procent pure kokosbloesemsuiker onder de naam Java Kiss in een mooie presentatie. De suiker wordt direct betrokken bij de producenten (direct trade). Java Kiss kokosbloesemsuiker heeft een volle, rijke smaak en bevat meer mineralen, aminozuren en vitaminen dan reguliere suiker. Deze kokosbloesemsuiker wordt relatief langzaam in het bloed opgenomen en doet zo de bloedsuikerspiegel minder schommelen. De glycemische index (GI) ligt met 35 een stuk lager dan die van biet- en rietsuiker (65). 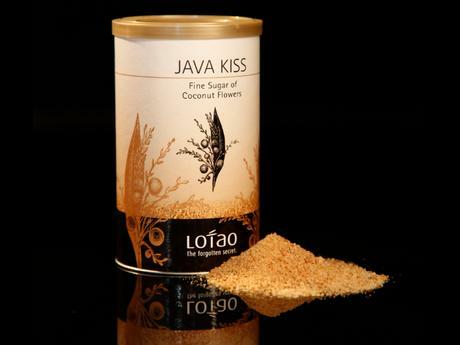 Asia’s best kept secret is now being shared with the world: Java Kiss coconut sugar, derived from the coconut palm tree, is joining the ranks of the world’s “superfoods,” laden with health benefits and an incomparable fullness in taste. Java Kiss is wonderfully delicious, melting in your mouth imparting a butter-caramel taste that is unrivaled to other sugar. It’s utility is remarkably versatile and easy to use as well. With its low melting point, it dissolves easily in liquid, making it an ideal sweetener for teas and coffees. Furthermore, its high baking point makes it a perfect substitute for regular cooking and baking sugars and cookies, cakes, soufflé, and many more. Measuring Coconut sugar is a breeze as it is a 1:1 replacement. Just use the quantity that you would normally use! Java Kiss is not only beneficial for your health, but for the environment’s as well. Coconut sugar was named by the Food and Agricultural Organization (FAO) of the World Bank as the single most sustainable sweetener there is. The coconut palm trees from which the sugar is extracted requires less than 20% of the soil nutrients and water that sugar cane requires, yet it yields about 50%-70% more sugar per acre. The agricultural ecosystems in which these trees are cultivated are diverse and support local wildlife, while the farming of coconut palm trees restores damaged soils yet still survives drought conditions. While most palm sugar products in the market are combined with up to 90% refined white cane sugar, our organic coconut sugar is 100% pure, unrefined, and minimally processed to retain the nutrients.